John Fea on the American Bible Society and "Christian America"
I'm in Texas (YeeHaw?) until tomorrow. Regular blogging will resume later this week, when I will confess my writing sins since departing for Indianapolis last week. Ah yes. Shame. The purpose of this blog. Until then, I wanted to encourage folks to check out my interview with John Fea on his new book The Bible Cause: A History of the American Bible Society. I particularly appreciated the link that John makes between the rise and development of the ABS and the rise and development of the "Christian America" narrative. John visited Saint Francis back in March. He was the keynote speaker for our undergraduate conference. He had mentioned then that The Bible Cause had build upon his previous book, Was America Founded as a Christian Nation: A Historical Introduction. Here, John stresses that this question--Was America Founded as a Christian Nation?--is fundamentally unanswerable. The "founders" were by no means a religious monolith. And most of the rhetoric associated with "Christian America" developed in the nineteenth century. 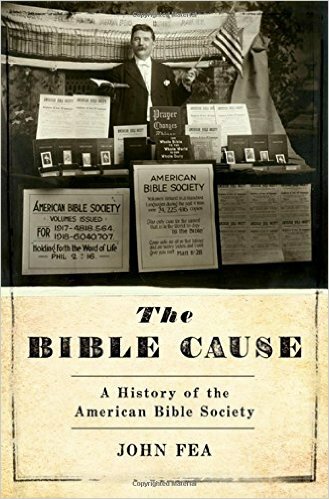 So the Bible Cause examines one organization that contributed to this narrative, linking the distribution of bibles with the presumed divine destiny of America. Give the interview a listen and pick up the book. I would add that you can't go wrong inviting John Fea to your campus. His talk was engaging from start to finish and we are still commenting on how much we enjoyed the event.